The Basement: What Would You Do? When it comes to decorating, I'm fairly decisive. I usually have an instinct from the first time I see a space, knowing what general direction I want to take it in. And when I pick finishes or colours or materials, I find things click into place, one by one, and I have a gut reaction when I've stumbled upon just the right "thing". But this basement bathroom, well, this one has me stumped. It started with the beadboard. I've been craving a hint of mint in my home for the longest time. I can trace the obsession back to these images of Miette candy store featured on Design*Sponge way back in 2007. Finally, I had a space in which to use this delicious colour! 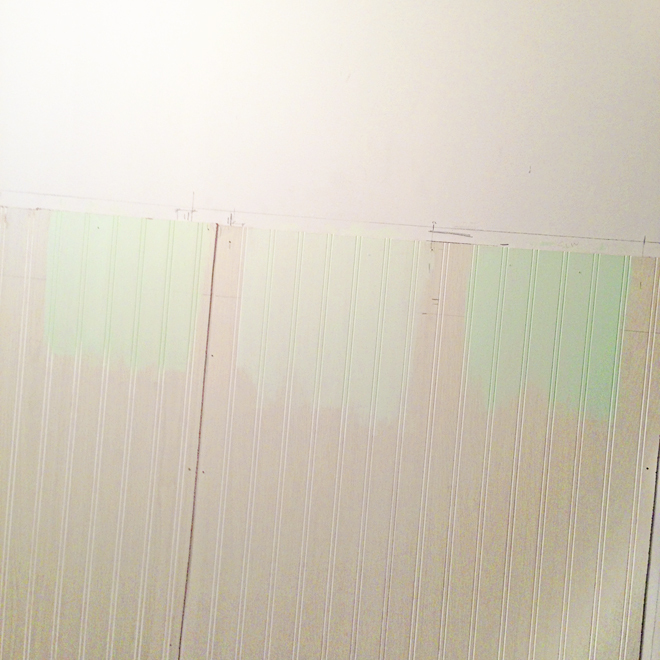 But once I put the sample paints on the walls, the room just felt kind of "blah", not fresh or crisp like I wanted it to feel. :( HandyMan finished installing the trim and the beautiful details begged to be noticed. No colour does that better than white so we painted the walls and trim in Para Paints' Whitewash White, P2089-00, the same white we'd used on the rest of the basement trim. It looks clean and modern and felt just right. At least this dilemma was solved! Now what to do with the area above the beadboard? I always thought I'd use wallpaper (I even instagrammed these options way back in September!) but either the pattern scale has been too large for this small area or the wallpaper feels too dark, too light, too boring, too whimsical, etc. etc. Aggggghhhhh! 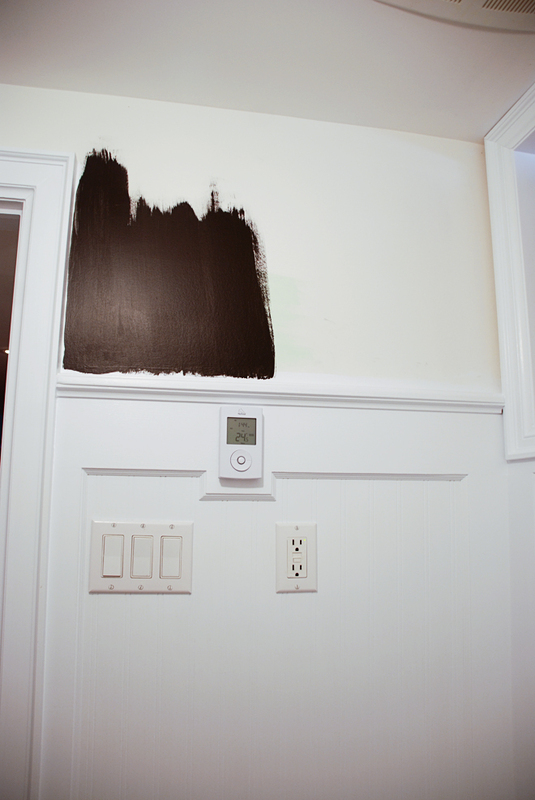 I've tried an almost-black paint... but with the low ceiling (less than 7') and the small room size, it felt a little top heavy. 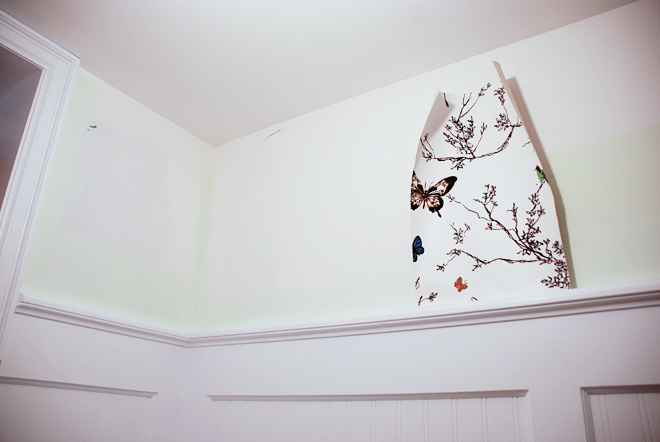 This Schumacher Birds and Butterflies wallpaper has long been a favourite... but we already have three different whites in the room (beadboard, toilet, shower subway tile) and this would be a fourth slightly different white. [On a sidenote: have you seen Shannon's DIYed version of this wallpaper? Amazing stuff!]. I just don't know what to do in this room anymore. I'm sad to admit this is why I haven't shared After photos of this bathroom - because I just can't get it finished! So here's where I put it to you talented folks... what would YOU do with the area above the beadboard? Paint? Wallpaper? What colour? What about the ceiling? I'd love to hear your ideas. Maybe a geometric stencil design? Something like YHL's home office?